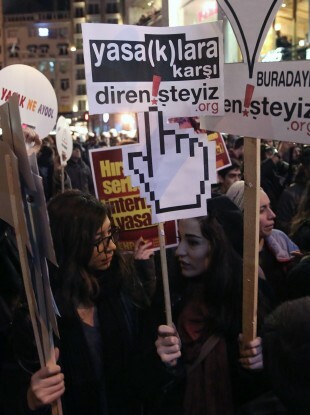 Protesters holding a sign saying 'we resist bans' at a protest against internet restrictions in Istanbul last month. TWITTER WENT DARK in Turkey late last night, just hours after Prime Minister Recep Tayyip Erdogan threatened to “wipe out” the social network which, along with others, was highlighting corruption allegations against his inner circle. The prime minister is openly suspicious of the Internet, and last year called Twitter a “menace” for helping organise mass anti-government protests. The Turkish strongman has accused associates of a former staunch ally — US-exiled cleric Fethullah Gulen — of being behind the graft probe that claimed the scalps of four ministers. Email “Turkey has blocked people from using Twitter after threat by PM”. Feedback on “Turkey has blocked people from using Twitter after threat by PM”.